The following article was found on the 2+2 forums. The original post by mason55 is titled 10k posts: Aggression Factor, VPIP and You! How to Relate the 3 and can be found here. It explains how to use the PokerTracker statistic called aggression factor. PokerTracker is a piece of software that imports your hand histories and shows you statistics about yourself and your opponents. You can use this to improve your own leaks, as well as finding leaks in your opponents’ play. Using the aggression factor statistic can be a bit misleading at times, so this article was written to help users evaluate the stat appropriately. It seems like people are constantly misunderstanding aggression factor around here. Hopefully this can clear some stuff up. It’s the ratio of the amount of time that a player is aggressive vs. the amount of time that he’s passive. It’s a pretty simple concept but it’s easy to misunderstand and misapply. 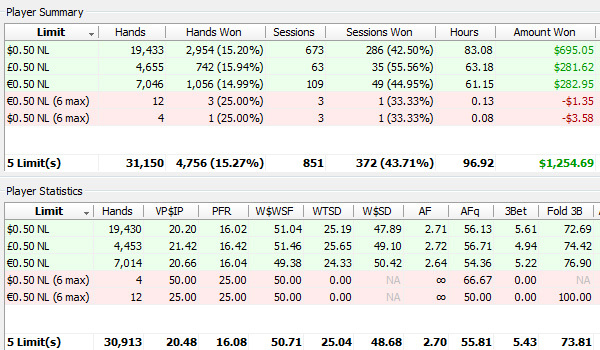 Screenshot of PokerTracker 3 Stats. Aggression Factor is the 8th tab labeled AF on the bottom. Aggression factor is a unit-less ratio. It’s not that useful without some other information. Just like most other things in poker, it’s almost always situation and player dependent, the only exception being a player with an AF of zero. For example, if someone’s aggression factor is 0 over 100 hands we can assume he’s pretty passive. He’s never bet or raised, only called and folded. If he WERE to suddenly raise us we’d be scared. Now let’s see how AF affects our everyday decisions. Take 2 players. A 50VPIP and an 18VPIP. Think about the approximate hand ranges that they’re seeing a flop with. Now think for a second about how each of those hand ranges hits the flop. The TAG is going to be making a lot of top pair, good kicker hands, as well as sets and combo draws. The fish is going to be making a lot of top pair bad kicker and midpair type hands. These 2 players have the exact same AF (3) but you can see that the fish is way more “aggressive.” His range when he raises you on the flop is weaker than the TAGs because his starting hand range is weaker. If you look at the AF formula, you’ll realize that it doesn’t include fold %. This is a pretty big limitation of AF and one that people seem to forget about. Let’s change the above example a little. The fish’s actions haven’t changed, but we’ve had the TAG fold some of his weaker made hands and slow down a little with his top pair hands. This is probably closer to a real distribution. Notice that AF is STILL 3! Even though we’ve strengthened his distribution for raising he still has the same aggression factor. This is where other stats on your HUD are going to be useful. Things like “Call continuation bet %” and “Fold to continuation bet %” will tell you whether a player with a high AF is playing raise/fold with his good hands or he’s a player who bluffs with air a lot. If you are a statistics nut like myself and enjoy having all of this information on your opponents; I would highly recommend the PokerTracker software. It takes all of the hand histories that you have played and imports them into one large database. You can then browse a vast collection of stats about yourself and the opponents you have played against. This is where the Aggression Factor statistic in this article comes from. Evaluating your opponent’s stats to find weaknesses in their game is an obvious benefit, but you can also find your own leaks and quickly improve your game by analyzing your PokerTracker stats. Unfortunately this software costs money to purchase because of the constant updating the developers must do. The full version costs $90, but there is a discounted rate for micro stakes players to pay $45 up front and $45 at the higher limits. I purchased the full version of PokerTracker because I was already playing 50NL and it was well worth it. I was quickly able to win back the two buy ins I spent and quickened my ability to move up in limits. You can support PokerTrikz and receive a free 60-day trial to PokerTracker by using our links when you visit their website. Great article what should be his call to continuation bet and fold to continuation bet percentage should be?